-Place ham in roasting pan, fatty side up. -Score the skin of the ham with a sharp knife in a diamond pattern. -Season the meat with salt and pepper to taste. -In a small bowl, combine the coconut oil and the minced sage. -Rub the sage mixture over the ham, making sure to get the mixture into all the slits. Place the ham in the oven and bake for 2 hours. -Heat saucepan over medium heat. Add all the ingredients for the orange/pineapple glaze, season to taste, and cook for 30 to 40 minutes or until the liquid turns syrupy. -Pour the glaze (including the fruit chunks) all over the ham and bake for another hour, basting the ham with the juices ever 30 minutes. 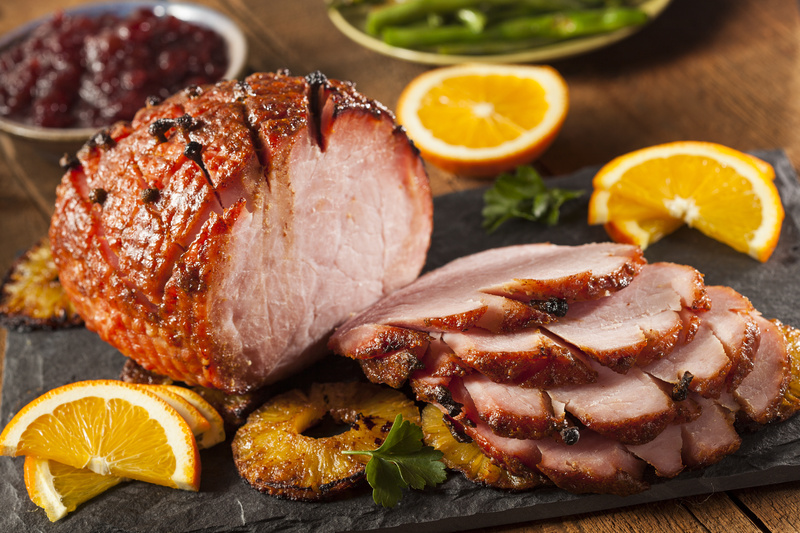 -Scatter the carrots around the ham and coat them with the juice. Then cook the ham for another hour (for a 4-hour total cooking time), basting again every 30 minutes.